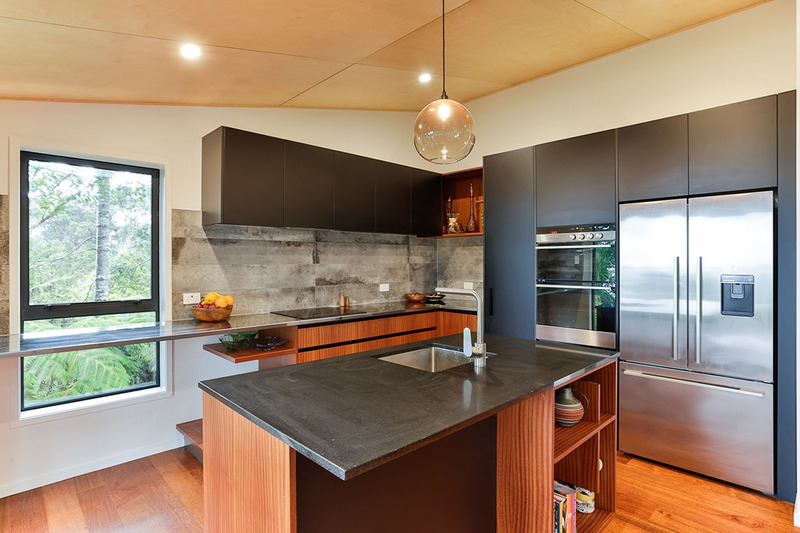 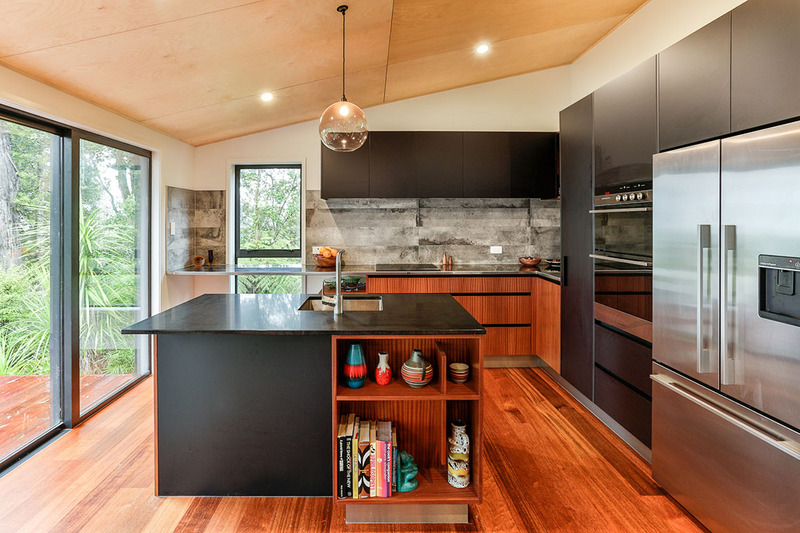 A client’s love of mid-century design determined the look and feel of this modern family kitchen, located in a beautiful bush setting. 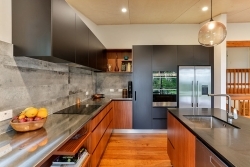 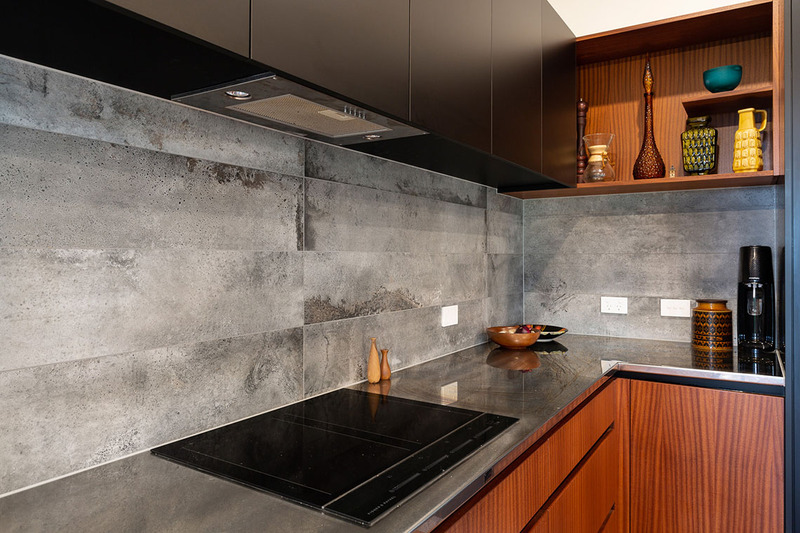 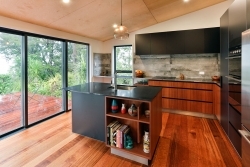 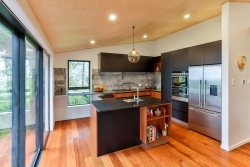 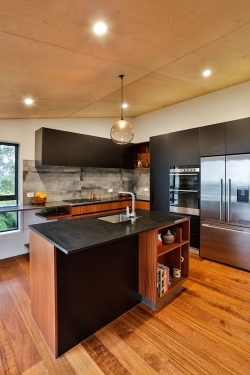 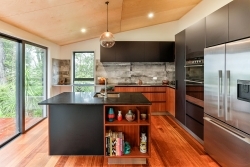 When Petra Brebner’s clients told her they wanted to have both colour and wood in their new kitchen, she was a little concerned, because the space in which the kitchen was located already had a native hardwood floor and plywood ceiling. 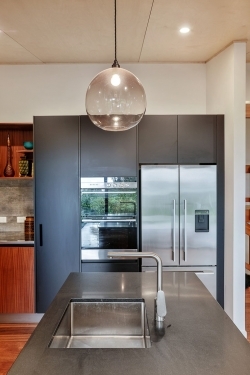 “My first thoughts were, this is going to look too heavy,” she feared. 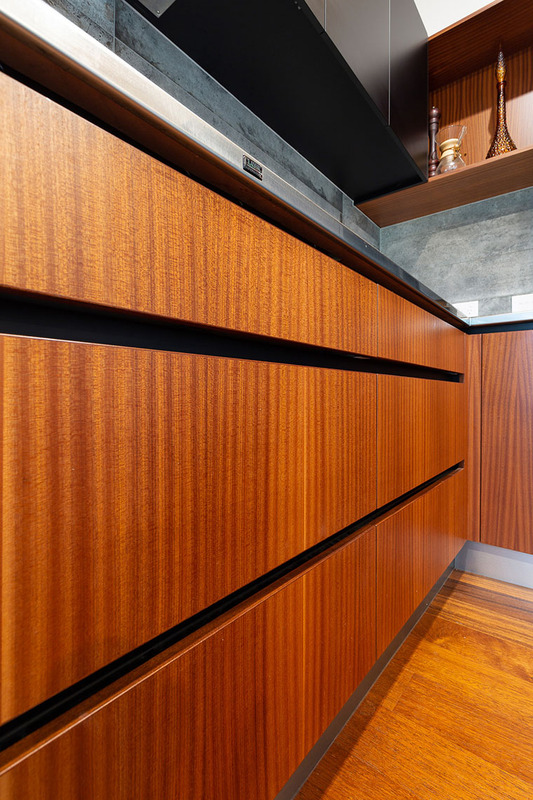 “Sapele has a distinctive grain that can look quite an old-fashioned if you’re not too careful,” explains Petra. But she goes onto to say it can also look stunning. 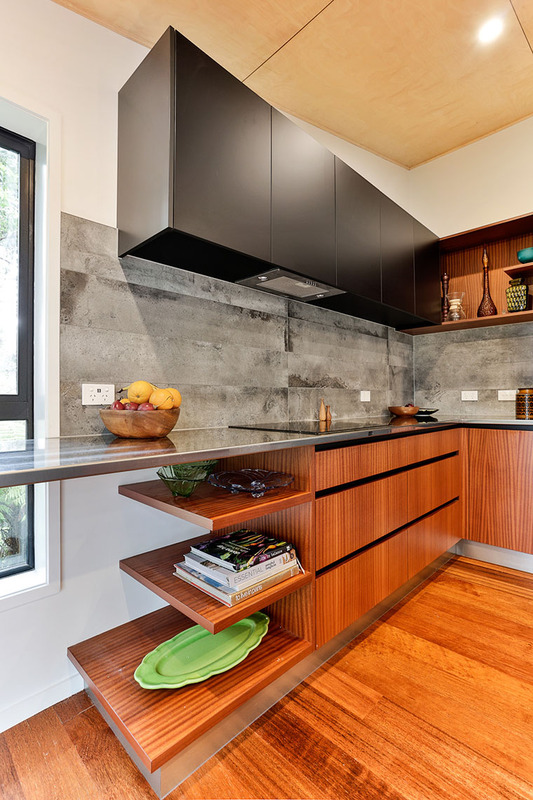 Just think about the distinctive grain used on the classic Eames chair. 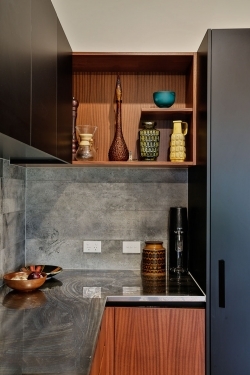 And that’s the look the designer was going for when she steered her clients away from colour. 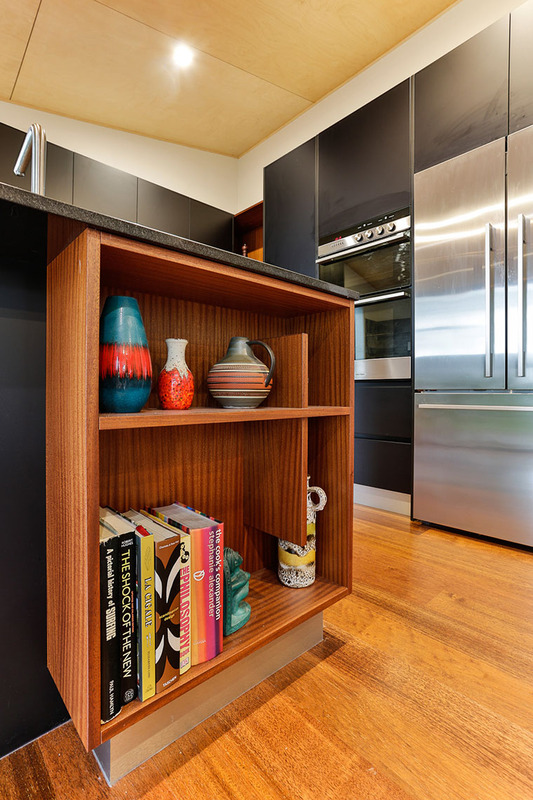 One specific request was for open shelving to display her client’s collection of retro ceramics. “I didn’t want to just give them plain shelving, so I introduced subtle details into the design, like finishing the vertical dividers short of the top and bottom of the unit, and only having shelving that goes part way across the open space. 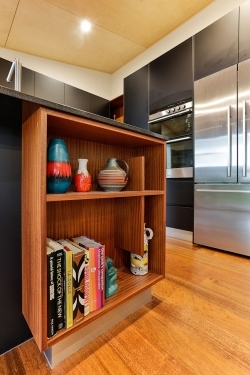 The shelving brings a furniture look into the kitchen that softens the space,” she adds. Aware that the open-plan room in which the kitchen sits is all about the beautiful bush views, Petra tucked the tall appliance towers and storage unit behind a nib wall, so that they are not the first thing that are seen when you enter the kitchen. 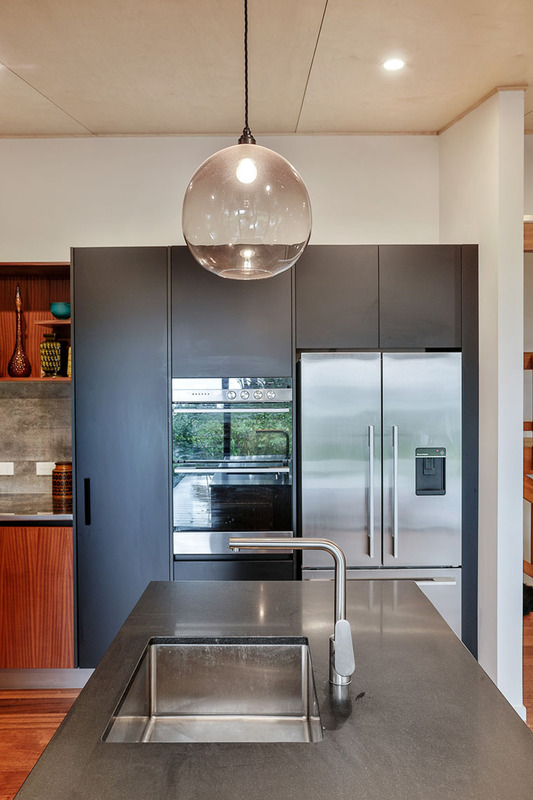 Overall, Petra’s design successfully respects the original aesthetic of home, and at the same time brings it up to date, creating a balance between giving her clients what they wanted in terms of a retro look and giving them a fresh, modern kitchen. 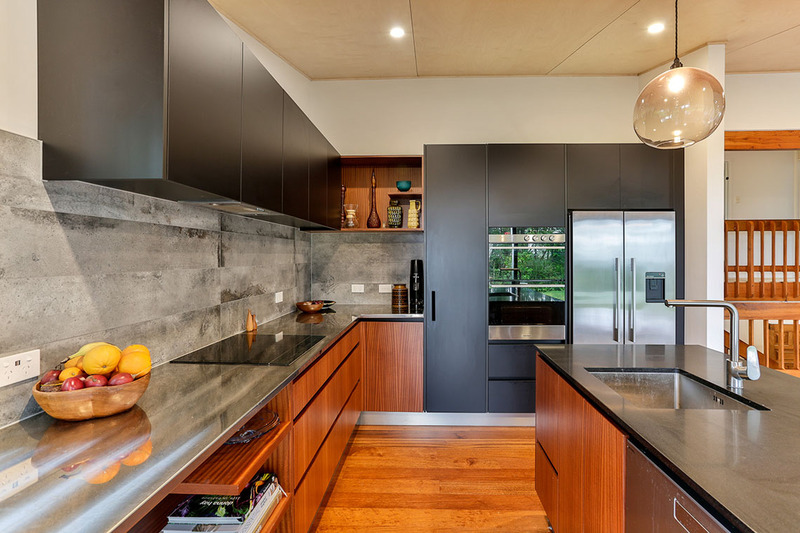 This kitchen was proudly designed, manufactured and installed locally by Mastercraft Kitchens New Lynn.